*All measurements are nominal. Carefully review specifications before ordering. The FSW Series Campfire Rings combine a single level swivel cooking grate with our flanged fire ring. The 300 sq. 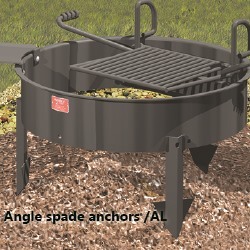 inch single level Swivel Grate will move 180 degrees – from over the fire to completely out of the fire ring – for easy fire building and serving. The handle is never over the fire. 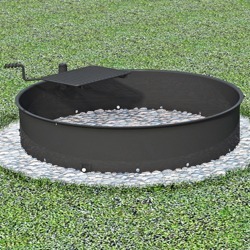 Fire ring is rolled from a 3/16" thick steel plate with an integral formed 1" wide flange around top edge. This flange provides extra strength against heat warpage and eliminates a vertical edge. Draft holes are provided for fire ventilation. Model FSW-56 Series Campfire Ring features a 54” inside diameter and is available in three different side heights of 7-3/8”, 9”, and 11-3/8”. 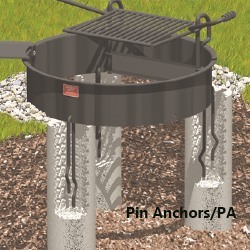 FSW Series fire rings include pin anchors (/PA) to keep the campfire ring secured in one place, but do not allow for tip back. These pins must be set in concrete. The cooking grate is a single, welded component using ½-inch dia. steel bars, mounted on a 2-3/8” OD steel tube allowing it to swivel 180 degrees. The operator handle includes a 1/8” x ½” flat bar coiled spring grip. All grate bars are welded on both sides. 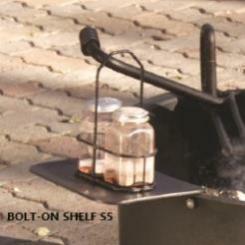 All fire rings are finished with high temp non-toxic black enamel paint. Angle Spade Anchors (/AL) are 4 spades attached around the firering and buried in the ground. The firering cannot be tipped up. 5 Year Manufacturer's Warranty against defects in materials and workmanship. 1-year manufacturer's warranty against materials and workmanship of High Heat Paint. Lead time: 2-4 weeks. This item is "Built to Order"